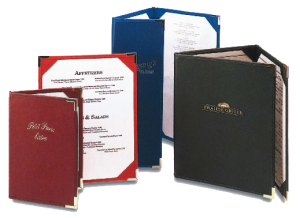 Casual Dining Menu Covers with corner tabs are perfect for a more up scale family restaurant, bistro or bar. The outside is made of durable imitation leather over rigid binder’s board and welt sewn with leatherette binding. Restaurant menus are held in place with corner catches (corner tabs) and match the inside panel material and binding trim for a nice sleek look. With the many material options our casual dining menu covers are great for creating a unique look for your restaurant menu covers. Custom decoration included and custom sizes available at no extra charge. Click on any Casual Dining Menu Cover with Corner Tabs for details and prices. 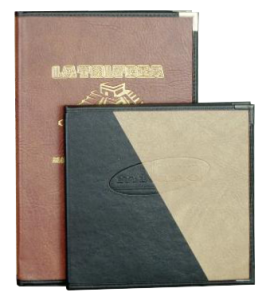 Rigid menu covers with imitation leather outside, sewn with leatherette binding and metal corners. Corner tabs on the inside panels hold restaurant menus in place. A rigid menu cover with very durable deep grained faux leather material outside, sewn with leatherette binding, and metal corners. Mix and match from a large selection of colors to create your one of a kind look. Menus are held in place with corner catch tabs. 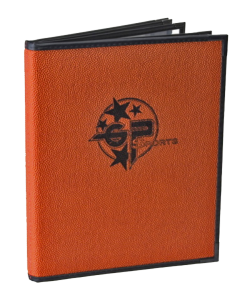 A rigid menu cover in your choice of football or basket ball material outside, sewn with leatherette binding and metal corners. Corner Tabs on inside panels hold restaurant menus in place.